America's most famous astronauts are at odds over President Obama's plans for National Aeronautics and Space Administration, which he plans to lay out on Thursday at a conference at the Kennedy Space Center in Florida. The president's plan to cancel a program known as Constellation, which aimed to send astronauts back to the moon by 2020, would be "devastating" for the United States, three astronauts wrote in an open letter, first obtained by NBC News. 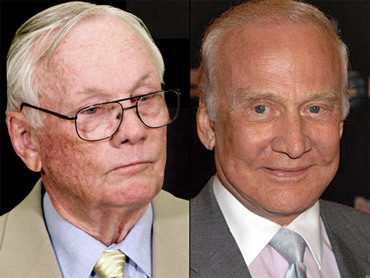 The letter was signed by Apollo 11 commander Neil Armstrong (at left in the picture), the first man to walk on the moon; Apollo 17 commander Eugene Cernan, the last man to walk on the moon; and Apollo 13 commander Jim Lovell. The White House is responding to criticisms of the plan with a defense from Armstrong's Apollo 11 crewmate Buzz Aldrin (at right in the picture above), the second man to stand on the moon. "We need to be in this for the long haul, and this program will allow us to again be pushing the boundaries to achieve new and challenging things beyond Earth," Aldrin said in a statement provided by the White House. Mr. Obama is actually proposing to increase NASA's budget, but he wants to terminate the $108 billion Constellation project, which the United States has already spent more than $10 billion on. Instead, the administration wants to outsource many of NASA's current manned exploration programs to private spaceships and focus on developing a new heavy-lift rocket for eventual manned flights to a variety of deep space targets, ultimately including Mars, CBS News space analyst William Harwood reports. The termination of Constellation is already facing resistance from members of Congress concerned about job losses it could create. The administration counters its plan will create 2,500 more jobs at the Kennedy Space Center than would have been expected under Constellation. Armstrong, Cernan and Lovell, however, are more concerned with how the president's plans could jeopardize the United States' position as a leader in space. The point out that commercial spaceships may not be available as soon as expected and that the U.S. would have to rely on Russia for space transportation until then. "For The United States, the leading space faring nation for nearly half a century, to be without carriage to low Earth orbit and with no human exploration capability to go beyond Earth orbit for an indeterminate time into the future, destines our nation to become one of second or even third rate stature," the astronauts wrote. "Without the skill and experience that actual spacecraft operation provides, the USA is far too likely to be on a long downhill slide to mediocrity." The administration argues that the U.S. could end its reliance on Russia's spacecraft more quickly with the development of private-sector rockets than it could have with the Constellation program's Ares rockets, Harwood reports. Aldrin agreed: "The steps we will be taking following the President's direction will best position NASA and other space agencies to send humans to Mars and other exciting destinations as quickly as possible," he said. The astronauts also took different perspectives on how Mr. Obama's NASA plan would impact the national psyche. The letter signed by Armstrong suggested the president's plan could imperil the inspiration historically attributed to NASA. "The people around the world were inspired by the human exploration of space and the expanding of man's frontier," the letter said. "It suggested that what had been thought to be impossible was now within reach." Aldrin, on the other hand, said, "The development of commercial capabilities to send humans into low earth orbit will likely result in so many more earthlings being able to experience the transformative power of spaceflight."